With the support of the Fondazione CR Firenze and the Municipality of Florence. at the theater box office from Monday to Saturday from 10 to 18. 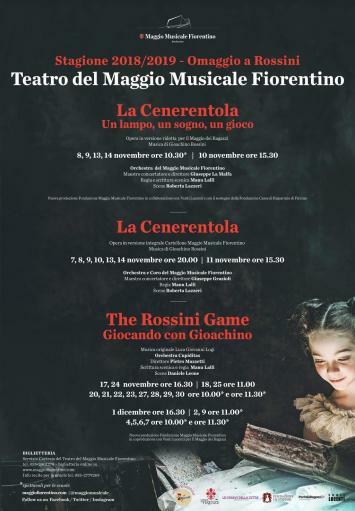 In the year in which the 150th anniversary of Rossini's death occurs, the Venti Lucenti with the Maggio Musicale Fiorentino propose their version of the masterpiece of the Pesaro composer, La Cenerentola, for stage writing and directing of the Maggio dei Ragazzi. Manu Lalli and with the music played by the prestigious Orchestra del Maggio Musicale Fiorentino, directed by maestro Giuseppe La Malfa. On the stage, next to the young singers of the Maggio Musicale Academy and the actors of Venti Lucenti, the children of the summer camp All'Opera ... in Campo and the boys of the projects of alternating school work. 150 young people of the city, after months of tests conducted by the choir master Andrea Sardi and the group of actors / trainers of Venti Lucenti, will give life to an amazing and crackling show as only Rossini's music can be. And this year there is something new: the beautiful setting, conceived by Roberta Lazzeri, is the same as the full Cinderella on stage in the same days, always directed by Manu Lalli. Cinderella, one of the most popular fairy tales in the world with the music of Gioachino Rossini! The meeting between the composer from Pesaro and the fairy tale could lead to the creation of an extraordinary work. In fact, Cinderella remains today, more than two hundred years after its debut, one of the Maestro's most represented works. A "special" version of Manu Lalli that brings together Perrault, Grimm and Rossini, ancient fairy tales with modern ones. But Cinderella is also much more. It is the story of a social redemption that takes place through one's own goodness and intelligence, the story of a little girl who dreams in the fairy tales she reads, waiting for a better tomorrow than the one in which she lives, made up of evil sisters and a cialtrone stepfather. It 's the story perhaps, a bit' of all the boys of yesterday and today, who "awaken" to life through the meeting of a beloved soul, finding themselves better than they imagined. This show is part of the project to popularize the opera At the Opera ... the schools in May, conceived and created by Venti Lucenti in collaboration with the Maggio MusicaleFiorentino Foundation, the Education Department of the City of Florence, Chiavi della Città, Fondazione CRFirenze, PortaleRagazzi.it., Which promotes among young people for more than ten years the wonder of opera theater involving not only primary and secondary school children but also hundreds of high school students, with the activation of numerous alternation routes school work (on this occasion with the students of the Istituto Superiore Elsa Morante / Ginori Conti, Liceo Dante music section, Liceo Castelnuovo, Liceo Michelangiolo, Liceo Russell Newton).